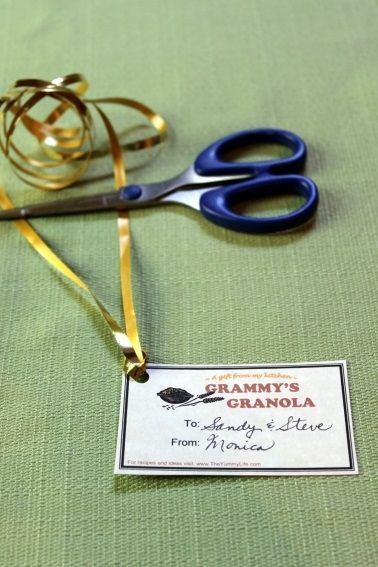 Grammy's Granola is something I love to have on hand for throwing together a quick gift. It's perfect to give as a host/hostess gift, a teacher gift, or really for just about any occasion. Homemade gifts are so much more personal and meaningful. This one is so easy to make, yet it's something that is always appreciated. There's something warm and nurturing about a wholesome jar of granola. a yummy-filled jar of goodness. If you want to decorate a jar like the one pictured above, here's what you need to assemble. First print out a sheet of gift cards. 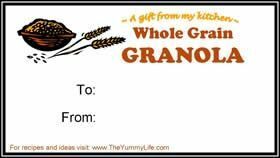 You can print on whatever paper or card stock you like. I used a natural-colored card stock for mine. Cut a gift card from the sheet, cutting carefully just outside the black border. Fill out the "To" and "From" with a pen. Use a hole punch to make a hole in the upper left corner of the gift card. For a quart size jar with a 3-1/2" wide lid, use a 9" plate or bowl to trace a circle on your wrapping paper. If your jar is a different size, you'll need to figure out a similar size ratio. Cut out the paper circle. 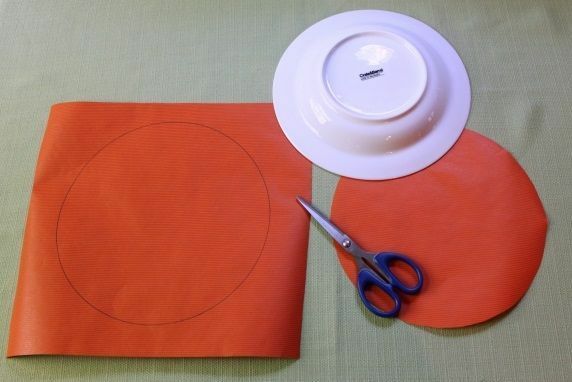 Note: You can cut a circle out of a piece of fabric instead of paper, if you prefer. 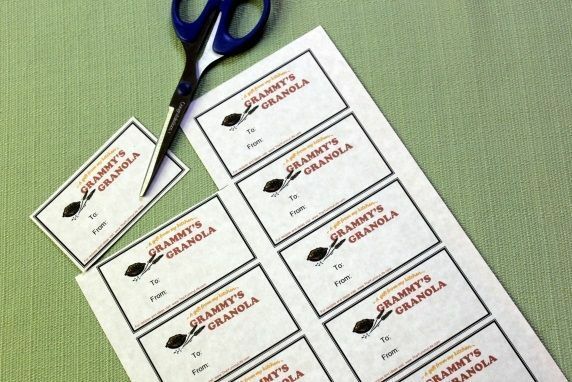 Cut a piece of ribbon that is long enough to wrap around the jar a couple of times so that the rubber band will be completely hidden underneath. Fold the ribbon in half, and knot it through the hole of the gift card at the ribbon's half way point. 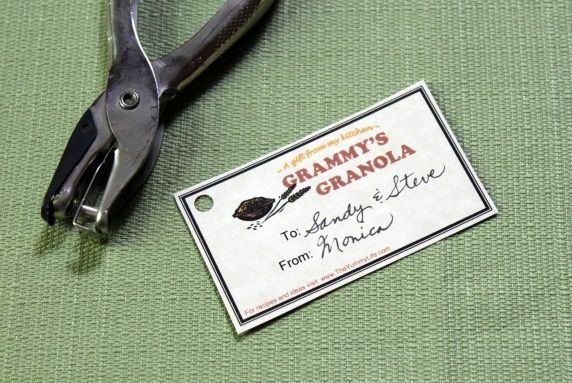 Center the tag on the jar, and wrap the ribbon around the rubberband so that it meets in front even with the tag. Tie the ribbon in a knot or bow. If you used curling ribbon, use scissors to curl the ends of the ribbon. Finished! 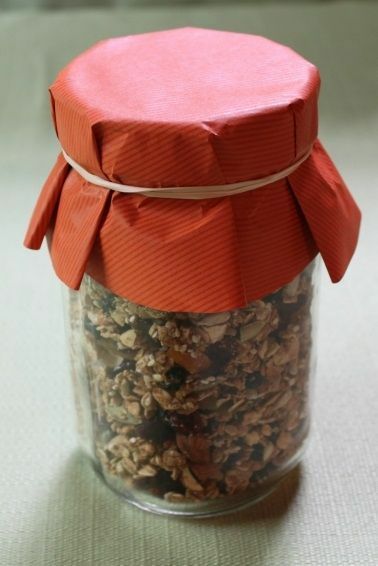 Your homemade granola and wrapping is ready to give. 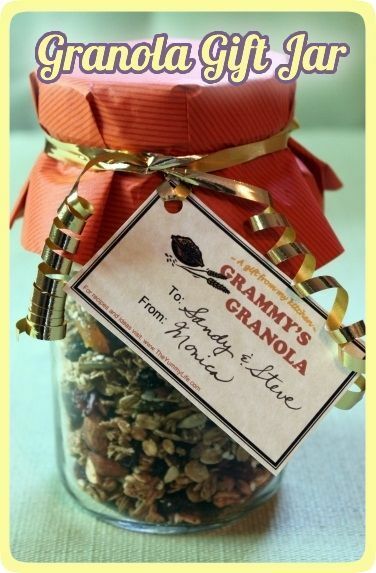 I'd love to hear from you if you make a granola gift jar. Do you have any other ideas for fru-fruing your gift jar? 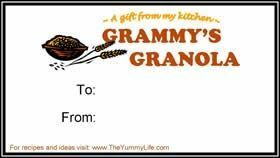 I hope this helps you give someone else a yummy day!